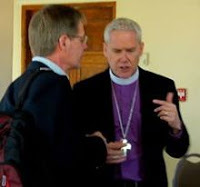 Each year during legislative session, the Bishop of the Rocky Mountain Synod of the Evangelical Lutheran Church in America (ELCA) hosts a legislative luncheon in Santa Fe. The luncheon hosted by Bishop Jim Gonia is an opportunity to meet and network with Lutheran, ecumenical and interfaith advocates from around New Mexico. This year, luncheon and issues briefing are scheduled for Monday, January 22. The luncheon will be at 12:30 pm at La Fonda Hotel, 100 E. San Francisco in Santa Fe (map). The cost of the luncheon is $35 per person. The cost is reduced to $30 when 4 or more people attend from your congregation or group. The annual Issues Briefing, will take place at United Church of Santa Fe, 1804 Arroyo Chamiso (map). Registration and refreshments will begin at 9:00 am. If you are only able to attend the morning Issues Briefing, the cost is $10.